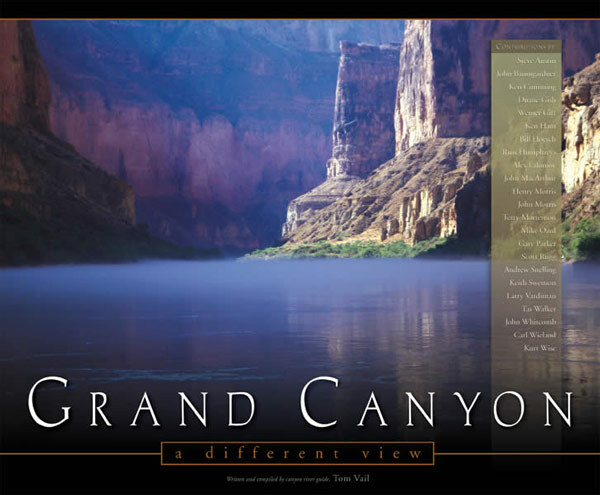 Creationists have long had a deep interest in magnificent Grand Canyon. Visitors to this awesome wonder of the natural world, as well as eighth-grade Earth science students, have traditionally been taught that it formed slowly. It was said that the Colorado River, much as we see it today, carved out this immense gorge over tens of millions of years. 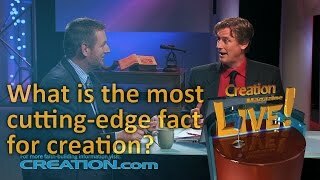 In recent years, Earth scientists have increasingly rejected that idea. Although they still speak in terms of millions of years, they consider that great volumes of water occasionally rushing through the area played a much bigger part in carving the canyon. 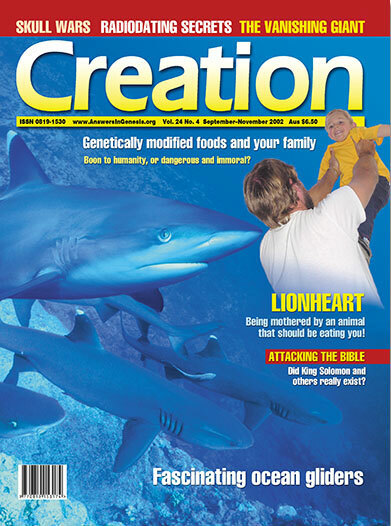 Creationist geologists agree that rushing water formed Grand Canyon. Some suggest it was Noah’s floodwaters as they flowed off the continent (Genesis 8:3). Others suggest it was a post-Flood regional catastrophe caused when a huge mass of inland water, left over from the Flood (and excessive post-Flood rainfall), suddenly breached its natural restraints and rushed to the sea. The idea that canyons invariably take vast ages to form is unfortunately very firmly cemented in the public mind. Even today, most school students are, regrettably, still taught the older, long-age model of formation for Grand Canyon, for instance. 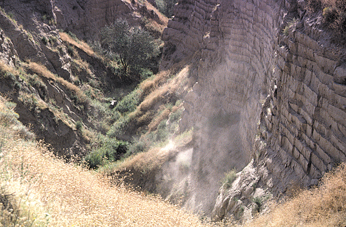 A small drainage ditch, like the one pictured (at top of page), was turned into the impressive canyon, well over 30 m (100 ft) deep, shown in the three other images. Layering evident in these photos was revealed as floodwaters cut through the ground. Let me introduce you to Burlingame Canyon near Walla Walla, Washington, a small-scale analogy to Grand Canyon, which was observed to form in less than six days. 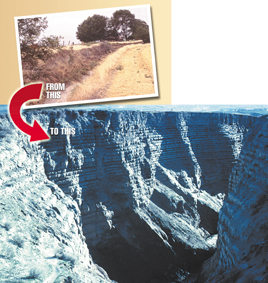 It measures 450 m (1,500 ft) long, up to 35 m (120 ft) deep, and again as wide, winding through a hillside. In 1904, the Gardena Farming District constructed a series of irrigation canals to provide water to this normally rather arid high desert area. In March 1926, winds collected tumbleweeds at a concrete constriction along one of the canals situated on an elevated mesa, choking the flow of water, which at 2 m3 (80 cubic ft) per second was unusually high due to spring rains. To clean out the obstruction, engineers diverted the flow into a diversion ditch leading to nearby Pine Creek. Before this, the ditch was rather small, at no location greater than 3 m (10 ft) deep and 1.8 m (6 ft) wide, and often with no water in it at all. The abnormally high flow crowded into the ditch and careened along until it cascaded down the mesa in an impressive waterfall. Suddenly, under this extreme pressure and velocity, the underlying stratum gave way and headward erosion began in earnest. What once was an insignificant ditch became a gully. The gully became a gulch. The gulch became a miniature Grand Canyon. The eroded strata consisted of rather soft sand and clay which was saturated by the recent rains. The dewatering of the saturated sediments into the now-open ditch enhanced the erosion. The rapidly moving water could dislodge the particles and carry them downstream, leaving underlying sediments vulnerable to further erosion. In total, these six days of runaway ditch erosion removed around 150,000 m3 (five million cubic ft) of silt, sand and rock. Yes, canyons can form rapidly. A good maxim to remember is, ‘It either takes a little water and a long time, or a lot of water and a short time.’ But then, we’ve never seen a canyon form slowly with just a little water. Whenever scientific observations are made, it’s a lot of water and a short time.